Guided group tours, for up to 20 people, are available upon request. Please allow up to four weeks in advance when scheduling a group tour. For more information or to request a guided tour, call (808) 586-9958. Tours for Kindergarten and First Grade students are 30 minutes long. Tours for Grades 2 – 12 are 45 minutes to one hour long. Tours with docents begin on the hour or half-hour. A maximum of two docented school tours can be conducted at one time. Self-guided tours can be planned by teachers (with informational materials from HiSAM). We require one adult chaperone per ten students. Please allow time to check backpacks, large bags and water bottles at the second floor security desk. There are no drinking fountains in the galleries. Restrooms are located on the first floor, Ewa side, and in the Diamond Head galleries. Security Guards and volunteers at the desks on the first and second floors can provide directions. Docents serve as your guides in the museum, but discipline is the teacher’s job. Make sure to review our museum rules with your classes before your visit. It is also helpful to review the rules upon your arrival to the museum. Please do not touch the artwork, or lean on walls or pedestals. Keep an arm’s length of distance between your body and all artworks. No food or drinks are allowed in the galleries. No running or playing in the galleries. No ink, please. If making in-museum assignments, please make sure students have pencils and paper for activities. Drawing is allowed, but do not use walls, pedestals or cases to write on. Clipboards are available at the security desk. 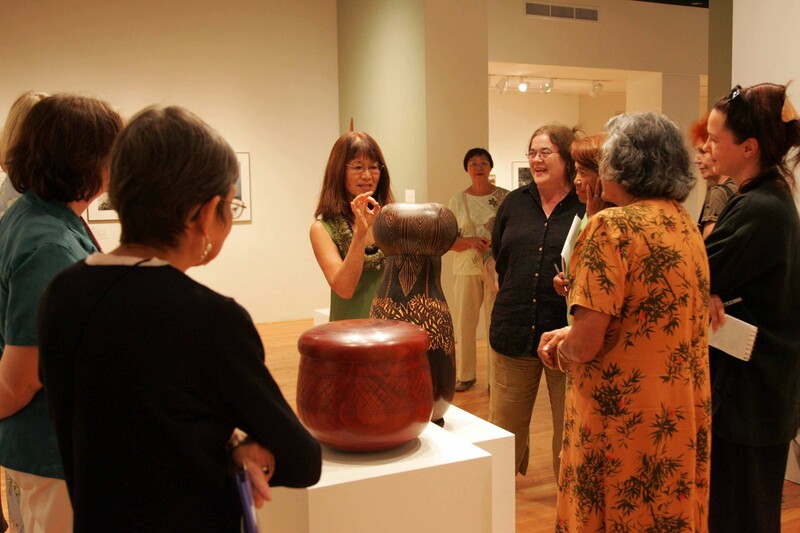 For more information, or to plan a docent-led school tour, a self-guided tour, or to receive Teacher Information Packets, please contact Susan Hogan, Museum Educator, at (808) 586-9958, or via email at susan.m.hogan@hawaii.gov. To plan a tour, please have the following information ready: proposed date and time, grade level, and the number of students and adults in your group.